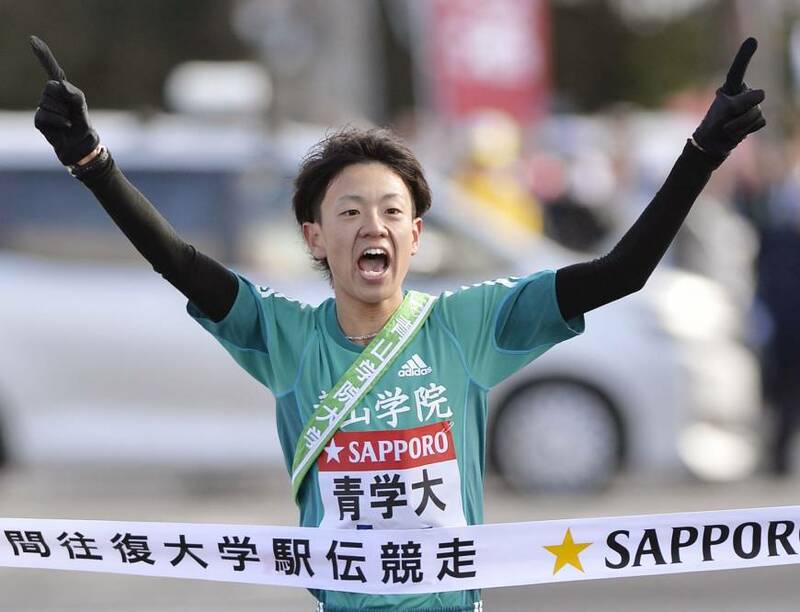 As Daichi Kamino crossed the finish line at the end of the first day of last year’s Tokyo-Hakone collegiate ekiden (relay marathon) championship, he ran straight into the arms of his ecstatic teammates. Kamino ensured Aoyama Gakuin University had a day to remember, seizing the lead from Komazawa University over the mountainous 23.2-km fifth stage and winning the opening day of the grueling road race for the first time in the institution’s history. This weekend, Kamino has a chance to enjoy the thrill of victory once more. On Jan. 2, relay teams will run the five-segment, 107.5-km leg between Tokyo’s Otemachi district and Lake Ashi in Hakone, Kanagawa Prefecture. On Jan. 3, the remaining team members will retrace the route in a five-stage, 109.6-km dash back to the capital. Last year, 200 runners from 20 universities took part in the race, as well as a team selected from the top runners of universities that are ineligible to participate. The Aoyama Gakuin team set a new record for the fastest cumulative time over two days and spent several months after the race nursing injuries (Kamino suffered a stress fracture) and preparing for the 2016 race and other national competitions. 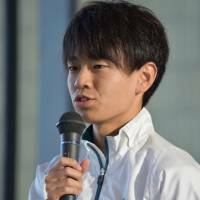 Aoyama Gakuin manager Susumu Hara says the team had set its sights on winning three major marathons in 2015 (including the Tokyo-Hakone ekiden), but stumbled in its attempt to take top spot at the national collegiate ekiden championship in November — Toyo University won that event, with Aoyama Gakuin taking second place. 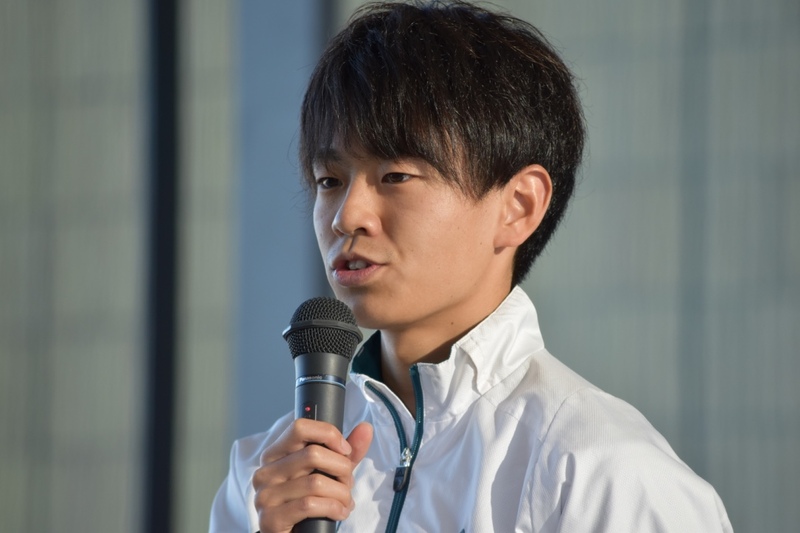 Hara says the team has been under a lot of pressure since winning the Tokyo-Hakone road race, forcing him to use other strategies to ensure the runners focus properly. “I’ve told them to run a race that will make them and the audience proud,” Hara says. Aoyama Gakuin is defending champion in the upcoming race for the first time in the college’s history, so it’s easy to understand how team members are feeling under the pump. Indeed, watching the Tokyo-Hakone ekiden is as much a New Year’s tradition as visiting shrines and eating soba. The relay marathon was first broadcast on Nippon TV in 1987 and its audience share regularly goes over 25 percent of the total number of viewers — one of the highest-rated sports broadcasts of the year. “As a result of being broadcast on Nippon TV, the Tokyo-Hakone ekiden has became a national event,” says Jun Ikushima, a sports journalist who has written several books about the race, adding that the timing of the broadcast is crucial to the event’s ultimate success. The climbing section was extended in 2006, which has also led to several mid-race dramas in recent years. Runners who excel on this leg are called yama no kami (mountain gods) — an elite club Kamino was added to after last year’s effort. Despite its enormous popularity across the country, the heartbreaking story of the man behind the country’s first ekiden isn’t widely known. In 1912, Shizo Kanaguri was forced to pull out of the marathon at the Olympics in Stockholm after suffering heat stroke. This bitter experience inspired Kanaguri to nurture a team of long-distance runners who could compete in Olympic marathons overseas. In order to set a goal for his runners to aim for, he organized a relay marathon from Kyoto to Tokyo — a distance of 516 km — in 1917. Influenced by the success of the race, Kanaguri persuaded four universities — Waseda, Keio, Meiji and Tokyo Koshi — to compete in a similar event between Hakone and Tokyo. University students who are not participating in the event as runners also get involved in the event. The Inter-University Athletic Union of Kanto, which features 20 student representatives from different universities in the region, is tasked with supporting the race. On race days, 20 students from the union and more than 1,000 assistants help to support the runners. 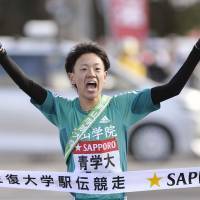 Kato, 22, has been selected to manage the Odawara relay post, where runners hand over their sash to a team member running the last leg of the race away from Tokyo. Kato has been a member of the student union for four years. Since her first year of study at university, she hasn’t had time to travel or work in part-time jobs like her peers. Working for the student union was tougher than she expected. Kamino says he wants to continue running long-distance races after he graduates, adding that he views this year’s race as an opportunity to end his university days on a high. Nippon TV will broadcast the Tokyo-Hakone collegiate ekiden championship from 7 a.m. on Jan. 2 and 3.